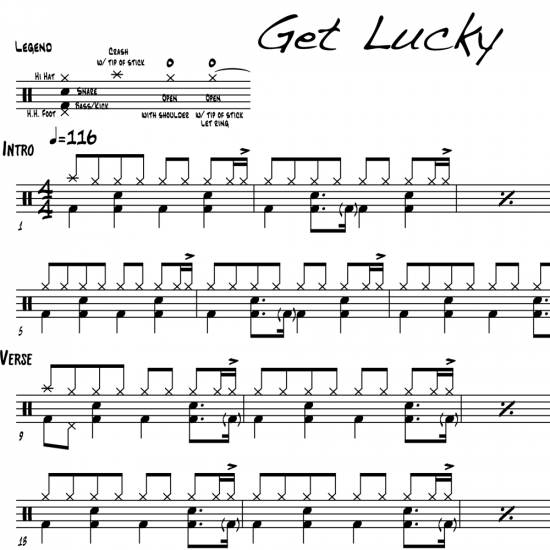 The full drum sheet music for “Get Lucky” by Daft Punk from the album Random Access Memories (2013). When you have a close listen to this drum track, it becomes immediately apparent that there’s a master behind the kit — the one and only Omar Hakim. Through subtle hi-hat dynamics and funky ghosted bass strokes, Hakim keeps this hit moving at a respectable dancing tempo (116 bpm). Get Lucky peaked at #1 in the charts in nearly every country. The hi-hat work should peak at #1 on your practice list.